3 Beds 2 Baths 1,783 Sq. ft. This is the one PRIVATE SETTING with GREENBELT & LAKE VIEWS Much sought after Lakeshore Village is a 55+ friendly community 3 Bedrooms & 2 Baths Vaulted ceilings Split plan design NEWER Kitchen NEWER appliances Impeccably maintained Furniture is available Shows like a model Relax in your Screened Lanai Lakeshore Village is an enjoyable community to stay active and meet neighbors at the community's heated salt water pool, tennis courts, playing horseshoes, fishing, or visit the recreation center Beautifully maintained, Lakeshore Village is centrally located within 15 minutes of what has been named the #1 Beach in the nation, Siesta Key Beach! 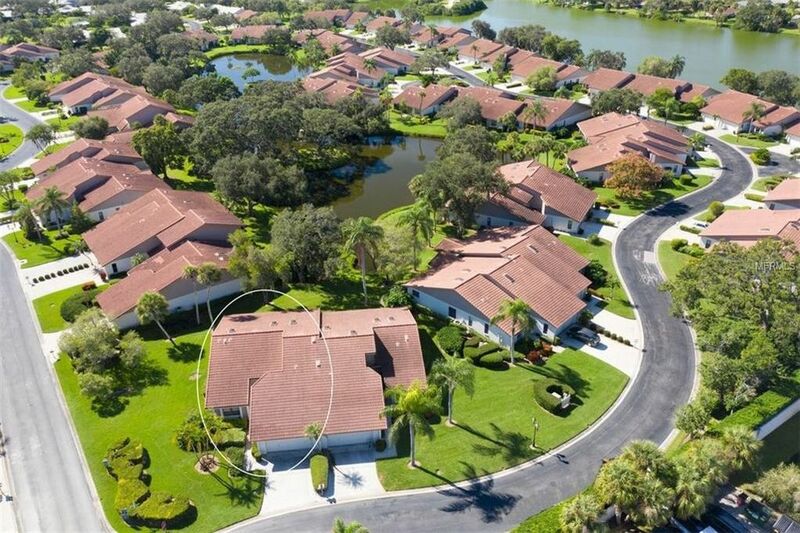 For your convenience, 1-75, downtown Sarasota and UTC are close by You'll appreciate the neighborhood pedestrian-friendly lifestyle, also within reach of number of restaurants and healthcare providers Enjoy your slice of paradise One look & you'll fall in love! Directions: Clark Rd between Beneva & Sawyer. South side of Clark on Wilshire entrance to Lakeshore Village. Villa on your right at entrance.